Home / News & Updates / Cellist Alisa Weilerstein '04 Receives MacArthur "Genius Award"
Cellist Alisa Weilerstein '04 Receives MacArthur "Genius Award"
Photo courtesy the John D. & Catherine T. MacArthur Foundation Cellist Alisa Weilerstein '04 has been named a 2011 MacArthur Fellow by the John D. and Catherine T. MacArthur Foundation. The foundation's website calls her "a young cellist whose emotionally resonant performances of both traditional and contemporary music have earned her international recognition." Weilerstein started performing as a preschooler and made her public debut with a professional orchestra at 13. While attending the College, she performed as a soloist and as a chamber musician. She has performed with orchestras throughout the United States and internationally, including the Berlin Philharmonic, the Chicago Symphony Orchestra, the Orchestre National de France, the Boston Symphony, and the New York Philharmonic, among others. In 2009, she was appointed artist-in-residence at the Cleveland Institute of Music. The MacArthur Fellows Program is intended to encourage people of outstanding talent to pursue their own creative, intellectual, and professional inclinations. The program awards unrestricted fellowships to talented individuals who have shown extraordinary originality and dedication in their creative pursuits and a marked capacity for self-direction. Fellows are selected based on their exceptional creativity, promise for important future advances based on a track record of significant accomplishment, and potential for the fellowship to facilitate subsequent creative work. 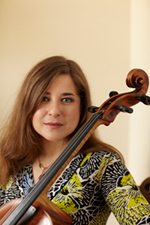 Weilerstein was one of 22 fellows selected this year. She will receive $500,000 over the next five years to be used in an area of her choice. Read the MacArthur Foundation announcement. Read a 2002 Columbia College Today profile of Weilerstein: "Cellist Balances Schoolwork with Global Performances."